Discover Bocas del Toro's underwater marine life! If you're on a budget and looking to spend less in your snorkeling tour, you could also consider a traditional boat tour to other destinations in Bocas. Having said that, take into account that very few captains take you to the very best snorkeling spots and if you want to go to the Bastimentos National Marine Park (where the Zapatillas Islands are, which have the most beautiful beaches and best snorkeling) you'll have to pay the $10 entrance fee in addition to your boat tour (the snorkeling tour described on this page includes this fee). 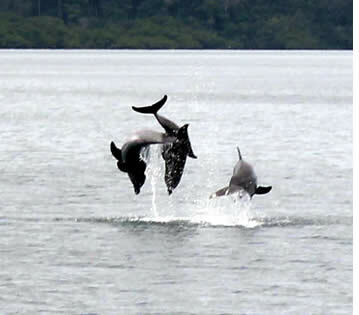 You'll first stop at Dolphin Bay, where you'll be able to observe bottlenose dolphins play at about 12 km south of Bocas Town (about 15 - 20 minutes by boat). This stop does not involve any snorkeling, as it's not allowed to swim in these protected waters and the water is full of yummy jelly fish (the dolphins love to eat them) so you really wouldn't enjoy it! Be patient, be quiet and look in all directions: some dolphins will eventually show themselves as they are known to come to Dolphin Bay all year round! You'll certainly appreciate being first to arrive at this location! Most tourist boats arrive later, so arriving early will allow you to see these beautiful animals in their natural habitat without being crowded by noisy tourists on boats. If you're lucky, the dolphins will come very close to the boat, thanks to their natural curiosity and playfulness. The captain will turn off the engine to guarantee the dolphin's safety and avoid making noise which could scare them away. Once everyone's satisfied by their dolphin viewing, you'll continue your adventure across the mangroves. 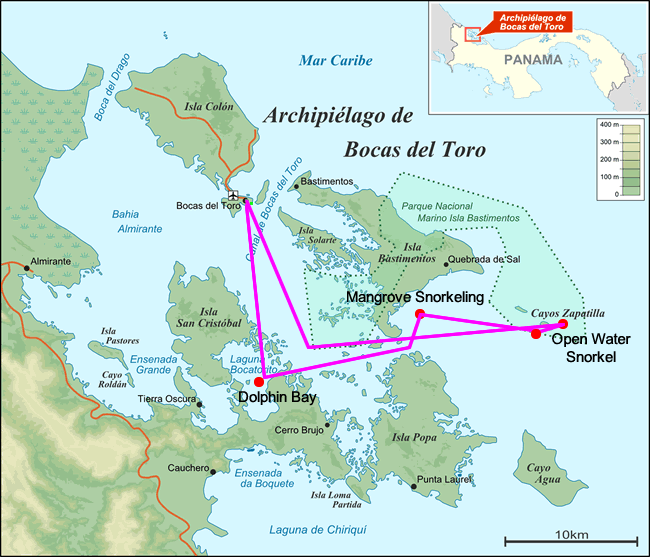 After Dolphin Bay, we pass Coral Cay and start bordering the eastern coast of Bastimentos Island. Once the captain reaches the perfect spot in the mangroves, the boat stops and you'll get off to snorkel the old fashion way for about one hour through the mangroves, in mostly shallow water. The goal here is to observe the amazing variety of corals of all colors and shapes (Bocas is home to 95% of the coral species found in the Caribbean), life under mangrove roots, and view sea life such as starfish, sea urchins, anemones, and lobster. This place is also the home of "the coward" as the crew calls it as an inside joke: "la casa del pendejo" in Spanish. This is in fact the resting place of a small nurse shark who normally spends the day sleeping under a huge piece of brain coral. The brave can dive a bit to take a better look at him - no worries, nurse sharks sleep during the day, and their diet consists primarily of crustaceans, molluscs, tunicates, sea snakes, and other fish, particularly stingrays. In between the mangroves and the Zapatillas islands, you'll stop where the water is deep enough and you'll start snorkel boarding. 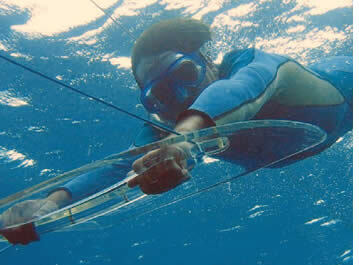 What's snorkel boarding? Click here to find out! The guides will give you a short security briefing prior to getting into the water to teach you how to hold the board, as well as some basic signs that are used among divers to signal that everything is OK under water. The boat can pull up to 3 persons at a time, and your guide will be swimming with you to ensure your safety. He will also point out things that you wouldn't see on your own with an untrained eye, thanks to his expertise in aquatic wildlife and his experience as a diver. Each turn lasts about 20 minutes. Once everyone has had the chance to coral surf, the captain steers the boat towards Zapatilla 2 (the smaller of the Zapatillas islands), where you'll stop for a home cooked lunch prepared by the crew. The Zapatillas Cays are known to offer the most beautiful beaches and the best snorkeling of the Bocas del Toro Archipelago. Once everyone's done eating and has relaxed a bit, your guide will take you on a small hike through the island. This island belongs to the Bastimentos Marine National Park, which is why you'll not be allowed to take any type of shells or anything with you. You'll be tempted because everything is so pretty, but note that it is prohibited by law. This island is similar to San Blas, with its white coral-sand beaches and turquoise blue waters. You'll not want to go leave this place! After the short hike, and after some time relaxing, swimming and sunbathing on Zapatillas Island, you'll then go to the third snorkeling spot located only 5 minutes by boat from Zapatillas. It is another place in the open sea, but without using the board this time. This last spot is hard to describe in words, because the variety of fish and corals you'll be able to see is just unbelievable. Here you'll be able to see everything if you're lucky and if sea conditions allow (when there is too much swell, it is not possible to snorkel here) - sharks, murenes, stingrays, and all sorts of fish of different colors you can possibly imagine. After about an hour, you'll head back to Bocas Town to be back at the end of the afternoon. * Prices are in US Dollars. The above prices are per person and do not include Panama's 7% ITBMS Sales Tax, nor the $10 National Park Entrance fee (Zapatillas Island). A minimum of 4 guests is required to book this tour. Tour itinerary can change depending on sea conditions. Please bring sunscreen and we recommend snorkeling with a t-shirt to avoid sunburns. Bringing your underwater camera is a MUST! Rates include boat tour, guide, cold beers or sodas, lunch snorkel boarding session, and snorkeling masks (half day tour does not include meals or drinks). Snorkel Boarding or coral surfing is a new method of snorkeling, by which you're holding a transparent board while you're being pulled by a boat at a very slow speed. This allows you to swim effortlessly and elegantly like a dolphin (you just have to hold the board), and you'll be able to come to the surface or dive down up to a 8 meter depth by just steering your board in the desired direction. If you prefer to just relax, you can also choose to stay on the surface and simply look down while the boat pulls you, and while you observe the underwater paradise from the top. The long strings allow for freedom of movement in all directions. The following video gives you a good idea about what it's like to coral surf! And don't be worried - this is by no means an extreme sport, and the boat goes really, really slow! The goal is not adrenaline or speed, but to allow you to discover the underwater world in new ways, with better access to areas that you would normally not be able to see if you snorkeled the old fashion way and to cover much larger areas in less time. This is, in our opinion, one of the Must Do's of Bocas del Toro! The best Bocas snorkeling experience! Contact us!